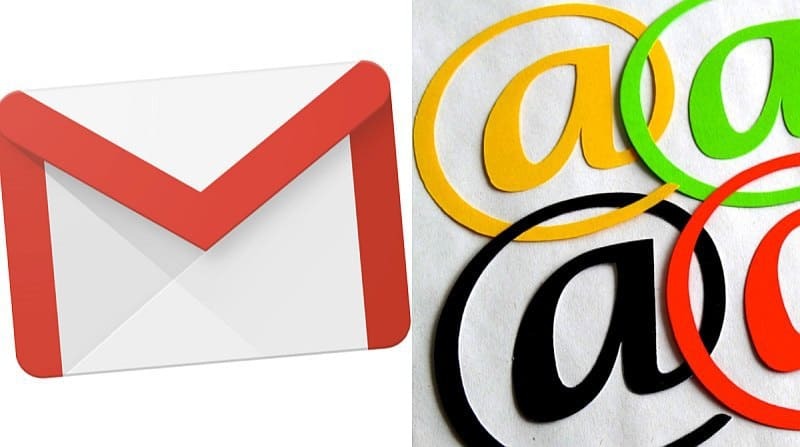 Being revamped a few days ago (Google I/O 2018), Gmail has been loaded with many tricks up its sleeves. One of another feature called ‘confidential mode’, check this article on how to use it. Now, here’s the point of this post. 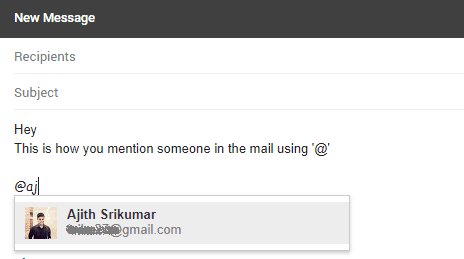 Mentioning people using ‘@’ while composing a mail in gmail is now as easy as you do on Twitter. Just type ‘@’ and start typing the first few characters of the name you want to mention, you’ll be presented with a hover list of names from your contacts list to make that easy to mention their name. The hover list with contacts is ordered in such a way your recent contacts are at first. So it is quicker to find the name, that you probably want to mention. When you mention people’s name in the mail, their email ID will be added as a clickable link under their name. If you know little html, you would easily understand if I say it’s a “mailto:” link. When your recipient clicks that link, it supposes to create a new mail compose window with the mail ID in the ‘to’ address. 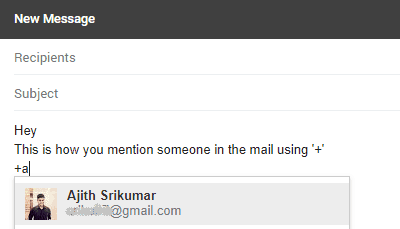 Actually, it’s a convenient way to share an email ID of a person with ease. You can use ‘+’ symbol/sign in the same way you use ‘@’ to mention people. Obviously, using + is Google’s way. Remeber Google Plus? Read also Google is manipulating you... time to know you're already a victim.